This wine shows great depth of flavor, length of finish, aromatic complexity, and a perfect balance between richness and finesse. You will find hints of white chocolate, brioche and orange blossom along with a hint of hazelnut. The wine is unfiltered which gives it a slight cloudy appearance. "Crisp and stony, this lovely wine is medium-bodied and balanced, with green apple fruit, Asian spice and a voluptuous texture and finish." Only 110 cases were produced. 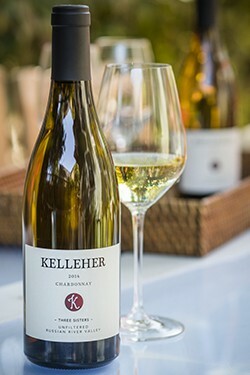 This is our second offering of our Three Sister’s Chardonnay. The grapes were sourced from a beautiful organic vineyard in the Russian River AVA. The fruit was hand picked in September 2015 once optimal ripeness was achieved. We focused on big, bright acidity and after the grapes were driven from the Russian River to Somerston Wine Co, where we do our custom crush, the grapes were then whole cluster pressed. After two days we racked off the gross lees and then barreled down to oak and stainless steel. Native fermentation began within 3 days, in barrel and continued for 45 days. We stirred the lees 3-5 times per week during this time and added nutrients at 23 brix and 18 brix.